Healthy snacking is a great idea, but I have to admit that I'm not virtuous enough to snack on foods that taste like hay and and twigs. If it doesn't taste good, I'm going to go looking for something else. It really helps if I make something at least vaguely healthy, and have it on hand. So when Clever Girls and Sunsweet offered an opportunity to have some fun with dried plums - the fruit formerly known as prunes - I jumped right on it. I like prunes a lot, but I usually eat them as-is, just snacking straight from the bag. They're a nice combination of sweet and tart, with a little chew to remind you that you're eating real food. My challenge was to create a healthy snack using the dried plums. Hmmm. After snacking though half of the bag of whole prunes they sent, I decided that the diced plums would make a good addition to baked goods, so I created this recipe for bars with oatmeal, white wheat flour (which is a whole grain product) and nuts. And of course the diced prunes. Dried plums and peanuts playing the starring roles as far as the flavor, with the plums adding sweet/tart to complement the savory nuts. Fiber is one of the good-for-you components, courtesy of the grains and the dried plum. Peanuts provide protein. And plums provide potassium. Texture is a big component when it comes to food, and the oats and nuts add their texture to these bars - but not so much that it's a chore to chew. Some of the oats are ground to a powder, so the bars have a slightly cakey, softer texture rather than being dense and chewy like a granola bar. And then they're studded with the soft, sweet, squishy dried plums. They're tasty, they're filling, and they're really easy to make. They're great for snacking any time, or for a quick running-out-the-door breakfast bar. Heat the oven to 350 degrees and spray an 8-inch square pan with baking spray. Take 1 cup of the oatmeal and grind it in blender, food processor, or spice grinder until you have a fine flour-like powder. You can also buy oat flour, but if you'r not planning on using it for other purposes, you might as well just grind your own. 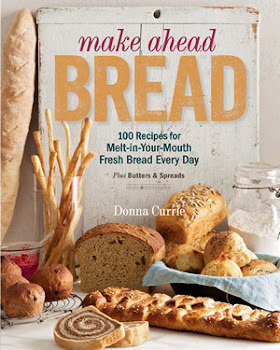 Combine the oat powder, rolled oats, white wheat flour (you can sub all purpose flour, if you prefer), baking powder, and salt in a medium bowl and set aside. Combine the peanut butter and brown sugar in the bowl of your stand mixer fitted with the paddle attachment, or in a large bowl where you will beat with an electric mixer. Beat the sugar and peanut butter until well blended. Add the vanilla and egg and beat until combined. Add the dry ingredients in three additions, alternating with two additions of the buttermilk - starting and ending with the dry ingredients. In theory, you could add all the buttermilk at once, then add the dry stuff - but, trust me - doing it in several additions is easier to get it mixed, AND it's less messy. Stir in the diced dried prunes and the peanuts. You just want them well distributed in the mix. If you want to add more, go for it. I won't tell. Transfer the batter to the prepared pan and spread it evenly in the pan. Bake at 350 degrees until a toothpick inserted in the center of the pan comes out clean - about 35 minutes. The edges will be slightly brown and will be pulling just slightly away from the pan. Let the bars cool completely before slicing into 9, 12, or 16 pieces depending on how snacky you feel! The three products that Sunsweet provided were whole prunes, diced dried plums, and plum juice. They said: PlumSmart® Light: This juice is made from a special variety of fresh, juicy plums and has only 60 calories and 15g of carbs, and helps you stay fit on the inside by providing a good source of fiber. PlumSmart Light is a great addition to a smoothie. I said: Okay, I haven't tried this yet, but I'm giddy excited that it exists. I love plums, but their season is so short. Plum juice sounds danged good, and if we're being honest, it's going to end up in a cocktail. Just wait. 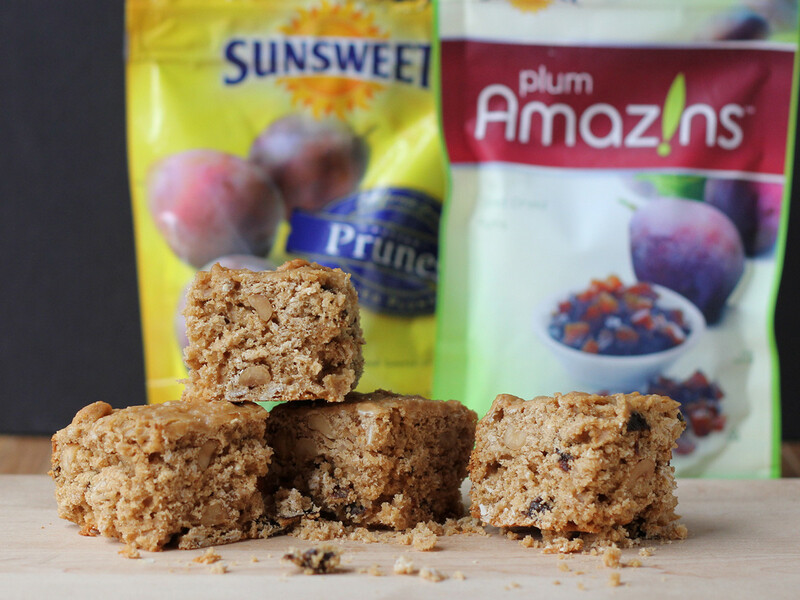 They said: Amaz!n™ Prunes: These little gems are a good source of fiber for only 100 calories per serving. Amaz!n Prunes are nature's perfect way to feel good with nutrition and delicious taste. Prunes also have a low glycemic index, which means they keep you feeling fuller longer. They add a powerful boost of nutrition and fiber to snack time or your favorite recipe. I said: I love dried fruits for snacking all on their own, and with a prune you get a quick fix of all the goodness of a plum in one bite. These don't last long around here. They said: Amaz!n™ Diced Prunes: Grab a handful of these delicious diced prunes for nutritious snacking. Toss them in cereal, oatmeal, salad or your favorite recipes for added flavor and fiber. One serving of Amaz!n Diced Prunes is a good source of fiber for only 100 calories. Add to your favorite snacking recipe for extra fiber and a fruit flavor boost. I said: Let's be serious for a second. Dicing dried fruit is not fun. It's sticky. It sticks to your knife. It sticks to your cutting board. You're not enough of a ninja to get pretty, even cuts. If you want diced dried plums that don't look like you cut them with a dull lawnmower, just buy the diced version. You'll save yourself a lot of frustration. Want to know more about Sunsweet? You'll find @SunsweetGrowers on Twitter and Sunsweet on Facebook.